you have waited for this text for a long time! 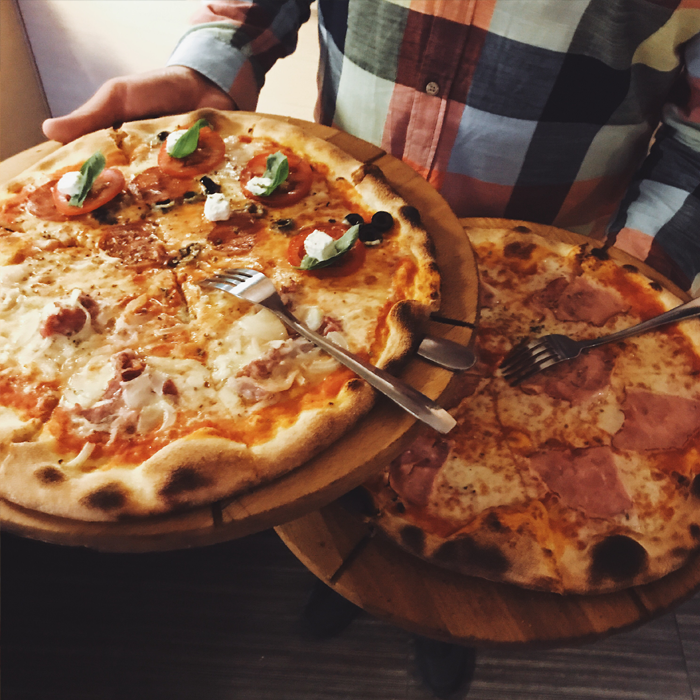 We prepared for you a list 0f 10 best pizza places in poznan. different spots, prices & locations. each one – very delicious! check out & plan your italian trips in our city! We are sure you know this one. Suszone Pomidory won our RESTAURANT OF THE YEAR plebiscite & we love them for many years now! We are truly addicted to eating their SPINACI or ACUTO pizza. More information about this place you’ll find in our MYTUJEMY CARD. Delicious Neapolitan pizza, cool products, great interior, and it’s all just a few steps from the Old Market Square! We return here regularly for lunches during the week or for extended weekend dinners. SZTOS is a must-visit place in Jezyce district! You can buy here pizza by slices for great price (9 PLN). We love especially for the location – the view from the window is amazing! We have good memories from this place, because we used to eat here many months before creating MYTUJEMY project. We love the typical Italian interior & the smell of freshly made pizza! PS. Find them on Glodny.pl. One of the most delicious places in Poznan, where you will enjoy excellent Mediterranean cuisine as well as delicious pizza! The magical interior of City Park is a unique place for a romantic date, meeting friends or having dinner with a family. Best Neapolitan pizza in Poznan! The restaurant located just outside the city center in Winogrady, tempts a large space and delicious cuisine. Freshly baked pizza, tomatoes San Marzano, Italian mozzarella, extra virgin olive oil, Italian parmesan and fresh basil leaves – eating here, you’ll forget about the world! Hint for you: you can also order their food on Głodny.pl. We know this place for a loooong time! Pizza by slices at Ratajczaka Street is something, that you have to try. Great paste, tomato sauce (one of the best in Poznan), comfy atmosphere… Visit Pizza a Pezzi with your friends & try one meter of pizza – that’s an experience! The only vegetarian and vegan pizza in our city! We managed to get a taste of it at Nocny Targ Towarzyski and, contrary to the prevailing legend among meat lovers that “vege & vegan is bad”, we tell you – it was really tasty! And the option with jalapeno peppers almost burned our throats! Delicious paste, unconventional flavors. Check out! Family restaurant on Marcelin, that we reaaaly love. Pizza served here is a bit thicker with the popular, but also quite surprising delicacies from sunny Italy. In addition, every day you try here dishes from the changing menu – steaks, pasta, it’s never boring! We never know what to decide! The little pizzeria near the Arena, thath we discovered & we are sure: it’s gonna be on hype soon! Pizza on a perfectly thin dough and ingredients imported directly from Italy. For a great home atmosphere, warm interior, and totally free service – you have to come here!